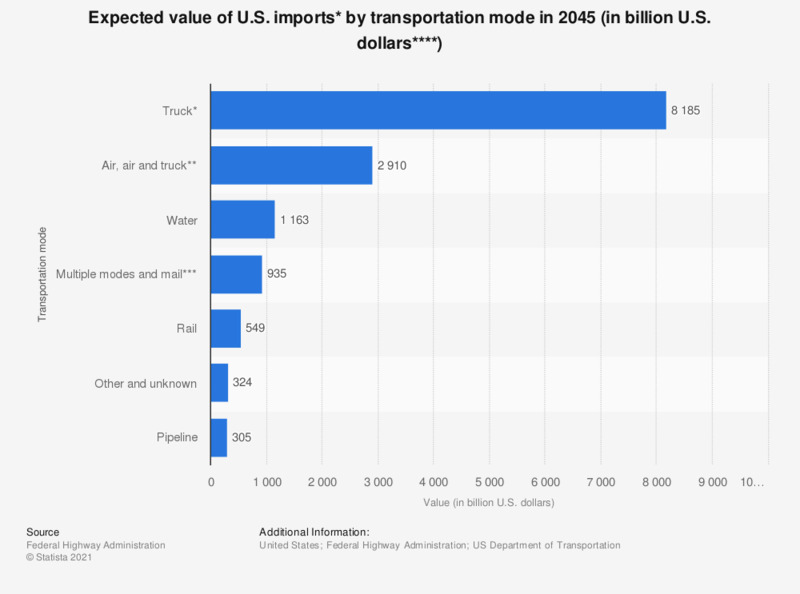 The statistic represents the value of U.S. imports in 2040, with a breakdown by transportation mode. At that time, the value of U.S. imports transported by rail is estimated to be 549 billion (2012) U.S. dollars. * Excludes truck moves to and from airports. ** Includes truck moves to and from airports. *** Multiple modes & mail includes U.S. Postal Service, courier shipments, and all intermodal combinations, except air and truck. In this table, oceangoing export and import shipments that move between ports and domestic locations by single modes are classified by the domestic mode rather than by multiple modes & mail.